And now for a bite of dessert. Kate conceptualized this Three Cubed cooking project as a way to expand our horizons and blow our minds, and so far it seems to be working! By forcing our spatulas a bit and getting us to try a few of the recipes we usually just skip over, we’re bound to be making things we have already decided won’t work out well or don’t meet our usual tastes, so there is a kind of odd dissonance at play in the kitchen during these experiments. I had already been having an arms-length affair with my copy of Dining on the B&O. 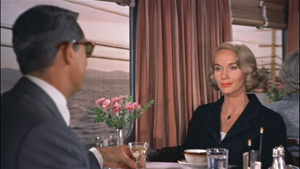 As I read through the special notes on everything from the salad dressings to the service style, I enjoyed imagining the staff in their efforts to pull decent dining out of a small, rocking and rolling kitchen (long before the microwaved chemistry we call travel dining today)–perhaps for Cary Grant, with his Gibson and his beautiful blonde, dining a la train car. That all said, I never felt motivated to actually cook anything from it. So this is exactly where the Three Points Baltimore branch decided to kick this project off. The B&O cookbook isn’t long, so I had to back up to page 127, where I was sad to see not only a dessert (we are not a dessert-eating household–birthday cakes and chocolate cookies are often, criminally, left to go stale on our countertops) but also one that required shortcakes. Images of spending hours producing dozens of cakes that no one would ever eat stomped on my enthusiasm somewhat, but I was committed to giving it a go. Crisco was purchased (lard, it is suggested, produces a better flavor and I was sorely tempted to go all out in the name of nostalgia, but just couldn’t do it in the end). Once the measuring was actually in process, however, I realized that I was only going to end up with four petite biscuits and that portion of the production would take only about 10 minutes to assemble and 15 minutes to bake off. Plus, consisting of just a bit of fat, milk, flour, salt, and baking powder, the biscuits would end up a rather all-purpose addition to my general culinary skills, such as they are. I ate one plain as soon as they were out of the oven and had to resist a strong urge to eat all the rest, flaky and warm and temptingly sans sweet fruit. Having no peaches or strawberries at hand, but a whole container of freshly cubed champagne mangoes in the fridge, I confess that I cheated on the fruit portion of this assignment. I whipped up some cream, assembled according the careful “chef’s notes” instruction as far as portion size was concerned (“tab” diners vs. a la carte changed the amount/price), snapped a few pics and called the resulting tower tasty. The only thing sweeter would have been to look out the window and see the station lights of some unknown city promising fresh adventure up ahead. Beautiful. But can you imagine trying to make biscuits on a train? I tried, rocking back and forth on my heels a bit, but I was clearly cheating. Considering how much trouble I have keeping my flour in the mixing bowl under stationary circumstances, I can only imagine the chaos.